Matthew 13 – What is your trajectory? 1 Peter 1:23 | For you have been born again not of seed which is perishable but imperishable, that is, through the living and enduring word of God. 1 Thessalonians 2:13 | For this reason we also constantly thank God that when you received the word of God which you heard from us, you accepted it not as the word of men, but for what it really is, the word of God, which also performs its work in you who believe. Jeremiah 4:3 | For thus says the Lord… “Break up your fallow ground, and do not sow among thorns. Due to a couple of small problems in navigation, ended up 150 miles off course! After flying over the Soviet Union, was shot down by a Soviet fighter jet over neutral water! All 269 people on board die, including a US congressman – former president Nixon had been scheduled to be on this flight, but didn’t take this flight. This illustrates an important LIFE QUESTION – what trajectory are you on? It is important to ask this question early on! The longer you wait, the greater the margin of error and the harder it is to fix one’s trajectory and get back on the right path. Think about it this way… You probably have amazing dreams and goals in your life. Goals don’t matter if you are heading in the wrong direction! In practical terms – habits and sins are easy to correct when they are fresh in your life. If you tolerate their “margin of error” over a long period of time, you end up over “enemy airspace” and risk a fatal attack! You may have seen the movie “Apollo 13” (NOT “Apollo 18”! That one was fictional!). 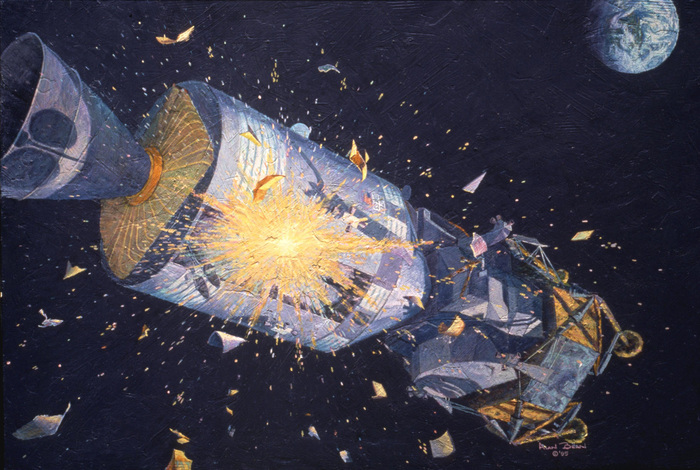 Right after the command module blew up, the astronauts needed to make a course correction – ASAP! The longer they waited to make the burn, the more fuel they would have to use. NASA knew that an early tweak in the trajectory early on would get the astronauts back on course – aiming for a “re-entry window” of only 2 degrees! They needed incredible precision to get back home. As Apollo 18 continued its difficult journey home, the astronauts needed to make 2 more minor course corrections – they were inexplicably drifting off course! Later it was determined that minor vapors leaking from the damaged craft were pushing them off course – just a little bit at a time, but amplified over the 240,000 mile journey home from the moon. They had to stop urinating, in fact, because the urine dumps into space were adding to the trajectory problems. They were literally “peeing” themselves out of a safe landing. Don’t you want your life to count? Wouldn’t you want to look back at the end of your life and see the you had CONTRIBUTED way more than you CONSUMED? CONSIDER 2 Peter 1:8 | For if these qualities are yours and are increasing, they render you neither useless nor unfruitful in the true knowledge of our Lord Jesus Christ. One of my greatest fear growing up was that I would waste my life! I only have one life to live, and I want it to count. I want to know that I have been “useful” and “fruitful” to God and to my world. In Matthew 13, Jesus tells the Parable of the Sower and the Seeds. It is really the “Parable of the Soils.” Jesus describes 3 soils that lead to fruitless, wasted lives – and one soil that leaves a legacy behind and describes a “life well spent”. Jesus explains that once the seed lands on “good soil” and has time to take root and grow, that it would bear fruit. Seed that landed on the wayside, or on the rocky soil, or on the thorny soil, would not take root – it might have apparent, temporary life – but after trials, afflictions, temptations, and worries it would disappear in the hot sun. The last soil is the “good soil.” Please don’t misunderstand! Jesus isn’t saying “good people” – He is saying “good soil”, and there is a huge difference! Good soil is simply BROKEN SOIL. If the challenge was to be “good” – we’d all put on a great show, but our hearts would be as hard, rocky, and thorny as the unproductive soils in the parable. BUT BROKEN SOIL – this is ready to receive the “seed” and show life! Fix your trajectory now – but do it through brokenness before God.